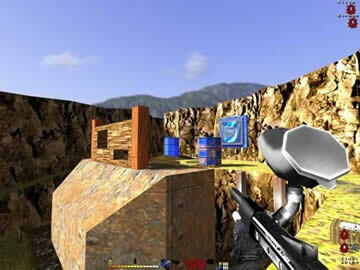 Digital Paint Paintball 2 Game - Download and Play Free Version! Experience the Thrills of an Intense Paintball Match! If you’ve ever played a paintball simulation, then the Digital Paint Paintball 2 controls will take you by surprise. The downfall of so many paintball simulations has been an absolute adherence to realism. The problem with that is that a paintball simulation is, by its nature, a first person shooter. So almost every gamer has developed habits and expectations for this style, and although the simulation may be correct technically, it doesn’t always feel that way, and perception is reality. Digital Paint Paintball 2 succeeds where so many other paintball games fail: it achieves a balance between realism and fun. The game uses fast-paced arcade-style controls, and this allows you to jump, dodge and achieve speeds that aren’t “realistic.” This lack of realism, however, is the beauty of the game. When we read the developer making a comparison to Quake, we scoffed a bit, but then, we tried it, and we realized it wasn’t only true, it was pure genius. Paintball by Digital Paint was a great idea. Paintball 2 is the realization of that idea. The movement is smooth, and it has correct ballistics. Anyone who has fired a real paintball will appreciate how the balls fire to the right of the target (or to the left, if the shooter is left-handed). Like the last version, Paintball 2 plays extremely well on older systems. What’s new this time around, however, are the optional hi-res textures, which make the game far more attractive for those with the rig to handle it. Sound snippets are brief sound files triggered by certain events, such as a kill. There are a series of built-in snippets, and players can import custom snippets. The files are extremely small, so when playing a multiplayer game, they download behind the scenes without disrupting play. Snippets range from sound effects to music to famous quotes from movies and cartoons, and they really broaden the experience. Digital Paint Paintball 2 includes both a client and a server. The server can host multiple players on a local machine, on a LAN or on the Internet. Most players won’t even need to set up their own server, however, since there are plenty of active servers that you can find right on the Digital Paint website. If you immerse yourself in the game, then there is an awesome experience awaiting you as you join a team and perhaps work your way up the leaderboard for that server. 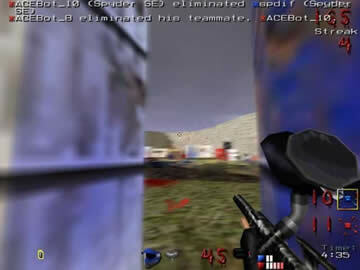 First person shooters are by nature violent, and they are becoming increasingly so. This is cause for concern for some parents, and for them, Paintball 2 is a nice alternative. It is an opportunity for their children to experience what’s great about the FPS style without having to deal with all the violence and language (although the online experience may vary).